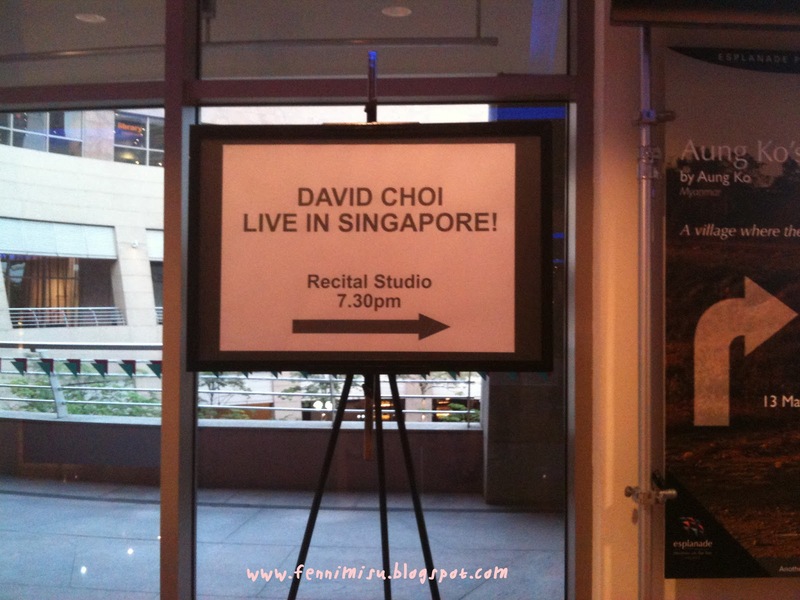 David Choi Live in Singapore! David Choi, my favourite YouTube star is in Singapore for 2 days, 21st and 22nd June, as part of his Asia Pacific & Australia tour! He went to Hong Kong, Malaysia, now in Singapore, and is going to Manila, Jakarta and Australia! Went for his meet and greet too, cos he's only in SG for 2 days, gotta make full use of it! 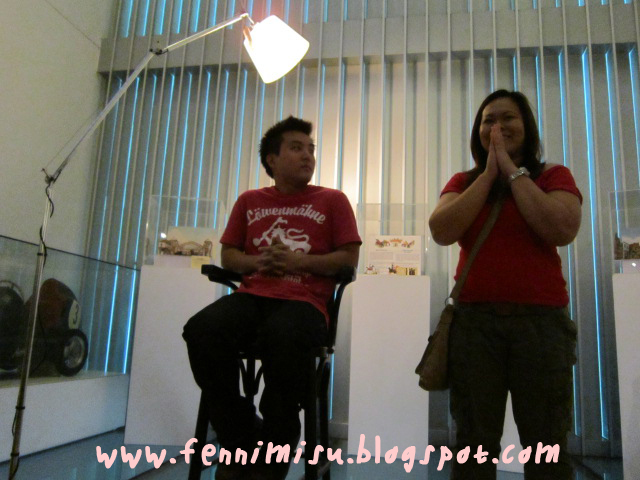 Meet and greet was on 21 June in a cosy corner at MINT Toys Museum just opposite Raffles Hotel. I got to play pick-up sticks with him!!! I chose pick-up sticks cos its the easiest of the 3 games there - pick-up sticks, five stones and chapteh hahaha. And when I went up, he said "hey I've seen you before. You came last year right?" Omg. It's kinda a super touching moment for me cos he remembers me from last year! Went with a few friends on my birthday to send him off at the airport last year, maybe that's why. While playing the 5 stones! "Oops! I got it, I got it!" The meet and greet was super upclose and personal with him, and only about 20+ fans attended. One has to get meet and greet passes through their fb contest, which says to give out 45 tickets, but only 22 fans joined, so basically everyone's a winner! All the better, right! 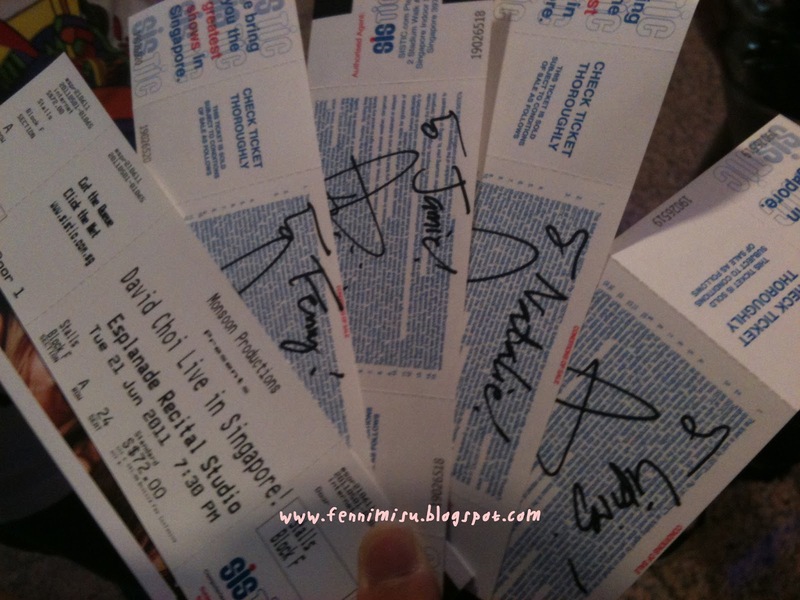 Liping's, Natalie's, Jamie's and my tickets, SIGNED! Meet and greet went like this > DC played pick-up sticks, played five stones, played chapteh, offered to give SGD$10 to the person who could kick the chapteh 10 times in a row, lent a girl his shoe to kick chapteh, showed us a picture from the set of his next music video, took a group picture, he tweeted the group picture straightaway, fansign! The time we were allowed with him is probably a lot longer at last year's HMV, and were more open too, as in we could chat a lil. Last year's HMV meet and greet - pass album, sign, maybe take a photo and his "manager" would rush you. And his concert was the real thing!! It was soooo enjoyable just listening to him and seeing how playful he is, and how this concert was more personal than other singers', who probably wouldn't share so much speech and fun but instead concentrate on singing. He's also a very true person, as in when he forgets the lyrics, he asked for another chance to sing again. Aww!!! I told him to write something random, and he wrote "I love chicken rice!" After the concert, there was an autograph session!!! Okay I succumbed and gotten his "Only You" album. Got in line (Jamie was second, I was third in line cos we chiong out after the concert!!) and got his autograph. Passed him my album, and I asked "Do you remember me?" 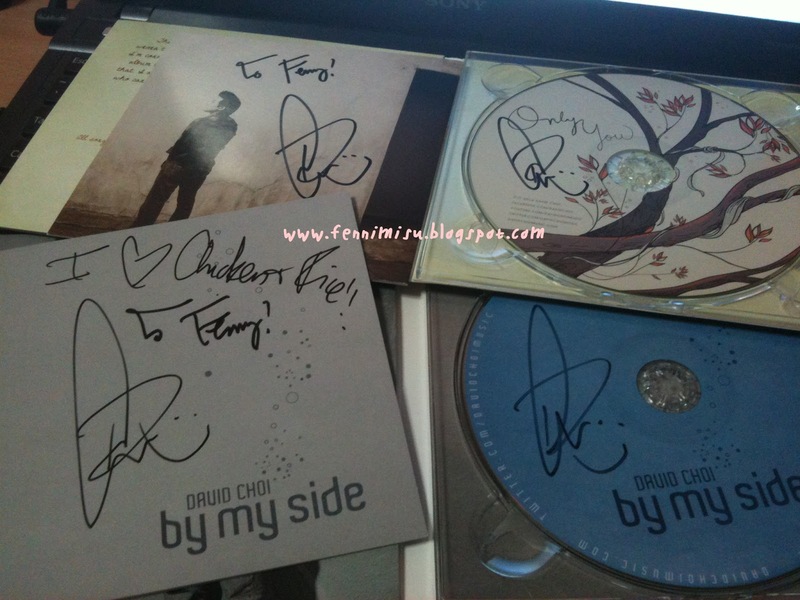 and he wrote "To: Fenny" and signed on the album, and smiled back at me! MELTZ MOMENT! Click here to view all posts of David Choi on my blog!